#Affiliate links in post : purchases made through these links do earn me a small commission. Thank you if you decide to shop through my links. Happy Friday! 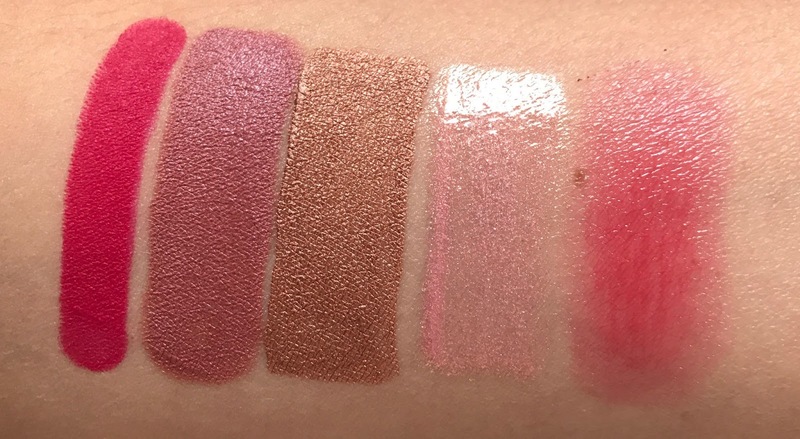 Today I have swatches of the brand new Sephora Favorites Give Me Some New Lip Kit. I am such a fan of these kits because you're able to sample 5-6 different products for a really low price. This kit is full of brand spanking new releases and is packaged in a new and quite fun little box that I could not pass up. 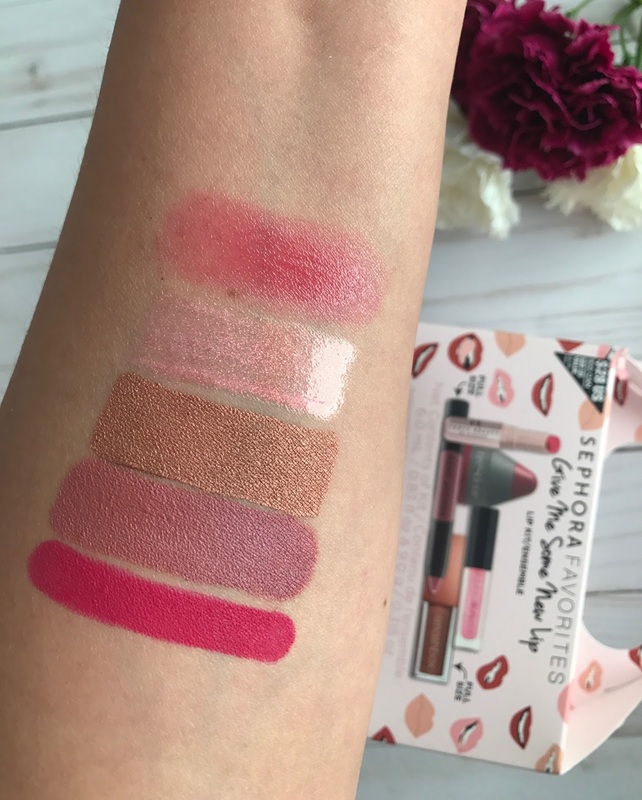 If you've followed me on social media or here on the blog for some time, you will know that these Sephora Favorites lips kits are some of my absolute favorites. 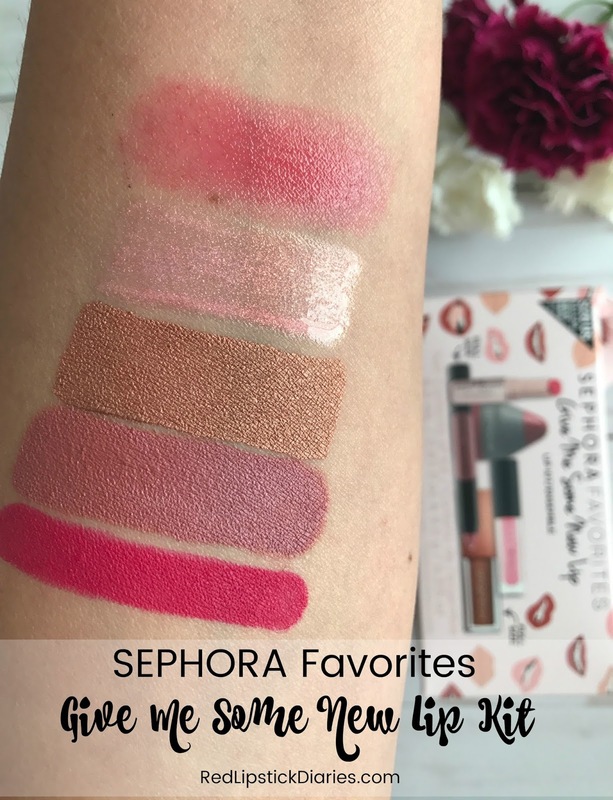 I have reviewed most of the prior Sephora Favorite lip kits which you can find by clicking the Sephora Favorites tab at the top of the page. This particular kit really appealed to me because it includes a full-sized Marc Jacobs lippie that just launched recently as well as one of the new Fenti Beauty lippies which came out just days ago. The Sephora Favorites Give Me Some New Lip Kit retails for $28 and includes two full sized products with a value of $50 alone. The retail value of the kit is $80, so you are definitely getting a good bang for your buck. These are the two products I was most excited to try along with the Huda Beauty lip strobe. As you can see, the Fenti lipstick is so adorably small, yet they really paid attention to detail when producing this deluxe size of it. It's almost too cute to use. This is a First Look so I have not had a chance to try the products out yet but will do so in the coming days. For now I am pretty happy with the selection and only find myself not loving the Smashbox metallic lippie. I am actually more excited now about the plumping lip balm than I was when I first saw the set. That's also really cute and I love that wash of color it has. I will have to test the plumping aspect and see if it does anything to my already big lips. I am so-so about this kit overall. I do like this new outer packaging. I think it's fun and cute and it's giving me Spring vibes, plus it's nice to see things switched up a bit. I have almost all the prior kits and it was nice to see a new presentation. One thing I did find disappointing is that the Sephora Favorites Give Me Some New Lip Kit only includes 5 products while all the kits I have reviewed in the past have had six. Last year they raised the price from $25 to $28 and this year they took out a product, not sure which I find worse. Value-wise though it is still a good deal and as long as they are products you will use, especially the full size, then still worth picking up. I will be testing these products in the next few days to see how I feel about all of them and deciding if it's a keep or a return. Will you be picking it up or is this a pass for you? Find the Sephora Favorites Give Me Some New Lip Kit at Sephora.